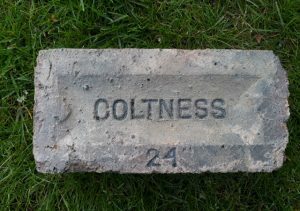 Home / Scottish Brick and Tile Industry / Coltness Iron Co Limited, Newmains, Lanarkshire. 1839 – Coltness Iron Company founded. There were some very old brick kilns to the north of the ironworks which are believed to date from around that time. 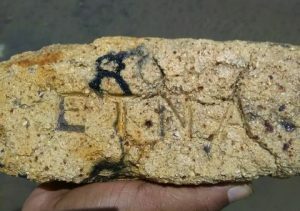 The Newmains Fireclay Works were their main brick producing site. Bricks manufactured at the Newmains Fireclay Works were lower grade and latterly they concentrated on glazed enamel whiteware. – Source Kenneth W Sanderson. 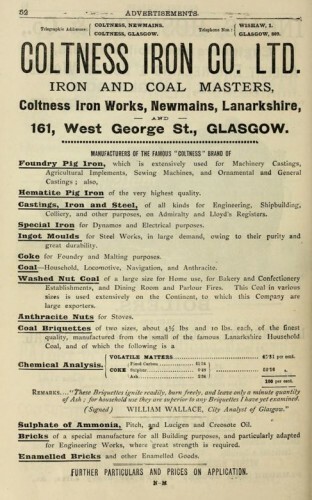 Below – 1893 – Advert Coltness Iron Company. 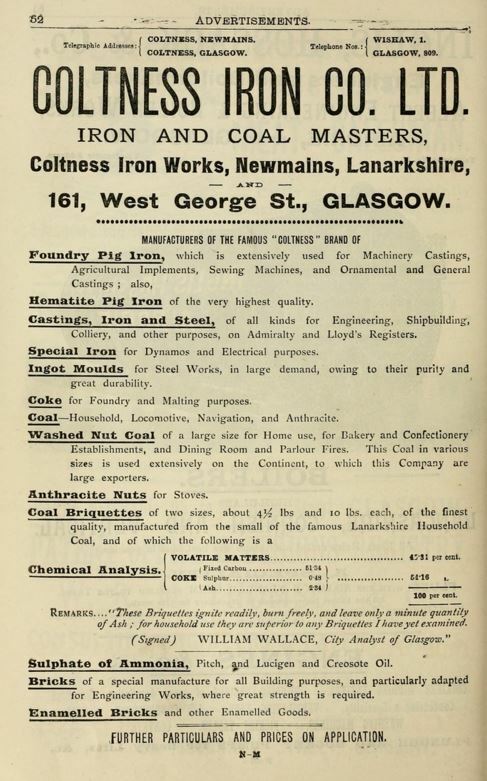 Below – 12/07/1899 – Daily Telegraph and Courier – Coltness Iron Company Limited prospectus. 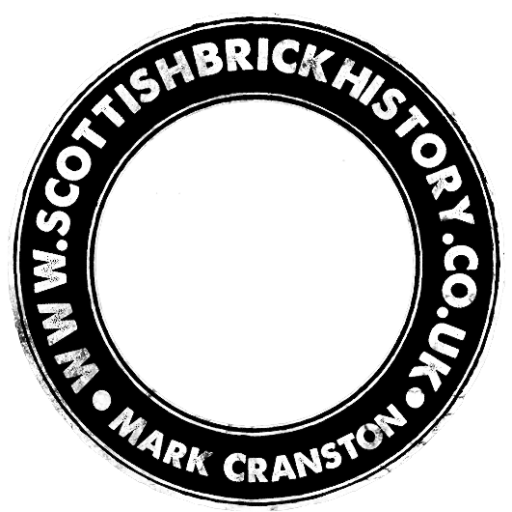 The three brickworks of the company are in efficient condition, and are situated at Newmains and Hallcraig, in Lanarkshire—both being the absolute property of the company—and Jordanhill, Glasgow. The manufacture of enamelled fireclay goods is carried at Newmains, and that of building bricks at Hallcraig and Jordanhill, the capacity of the two latter being about twenty millions of bricks per annum. The properties absolutely owned by tbe company, including the above-mentioned purchase, are follows(1) At Newmains, about 325 acres of mineral area, and 270 of surface area, upon which the blast furnaces, &c., are situated, and having abundance spare room for future extension. (2) Woodend, in Linlithgowshire, about 1,024 acres surface and minerals, upon which one of the company’s collieries. 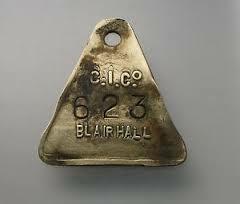 (3) At Hallcraig, in Lanarkshire, about 186 acres of surface and minerals, upon which is one of the company’s brickworks. The mineral in this property is chiefly clayband ironstone. (4) Mayfield and neighbourhood, in Lanarkshire, about 187 acres of mineral area —chiefly clayband ironstone and limestone. 12/10/1951 – Edinburgh Gazette – The Companies Act, 1948. Company Limited by Shares. Special Resolution (pursuant to Section 141 (2)) of Coltness Iron Co Ltd, passed 8th October 1951. At an Extraordinary General Meeting of the above-named Company, duly convened, and held in The Merchants’ Hall, 30 George Square, Glasgow, on the 8th day of October 1951, the sub-joined Special Resolution was duly passed, viz. :— That the Company be wound up voluntarily, and that Lieut.-Col. James Filmer Hamilton Houldsworth, Coltness House, Wishaw, Lanarkshire, and Ian Wilson Macdonald, Chartered Accountant, Glasgow, be, and are hereby, appointed Joint Liquidators for the purpose of such winding up. James F.H Houldsworth, Chairman. The Companies Act. 1948. Notice of Appointment of Liquidator, pursuant to Section 305. Members voluntary winding up. 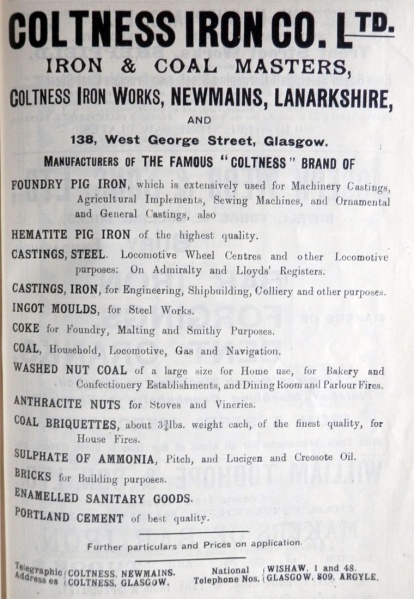 Name of Company—Coltness Iron Company Limited. Nature of Business—Iron Masters and Brickmakers. Address of Registered Office—118 Queen Street, Glasgow. Liquidators’ Names and Addresses—Lieut-Col. James Filmer Hamilton Houldsworth, Coltness House, Wishaw, Lanarkshire, and ‘ Ian Wilson Macdonald, Chartered Accountant, 149 iWest George Street, Glasgow. Date of Appointment—8th October 1951. By Whom Appointed—Members of Company by Special Resolution. James F.H Houldsworth, Ian W MacDonald, Liquidators. March 1970. – Clay Worker Magazine – Coltness Industries Limited – General Manager – Required to control entire operation of three Brickworks producing over one million common bricks per week. The works have been modernised with new Stiff Plastic Machinery, Conveyor Handling Systems and Hoffman Kilns and are well managed. The applicant should be 30 to 40 years of age. A high management ability and first class practical knowledge of brickmaking is absolutely essential. He must be conversant with and able to maintain full budgetary control and be prepared to spend time and energy on the continued successful operation of these works. The position will be one of direct responsibility to the Managing Director. The commencing salary will be £3,000 per annum with Company car, free life insurance, assistance with removal, good contributory pension scheme, eat. 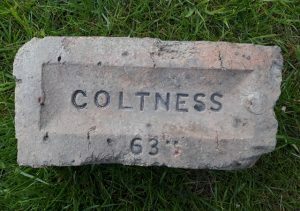 Mr A. L. Teller, Managing Director, Coltness Brickworks Limited, Church Avenue, Newmains, Wishaw, Lanarkshire, Scotland. 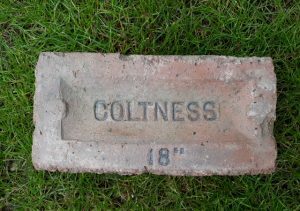 Below – Unknown date – Coltness Iron Co , Newmains, Lanarkshire advert….bricks for building purposes and enamelled sanitary goods…. Found by Jeannie Cooper in the Dundee area. 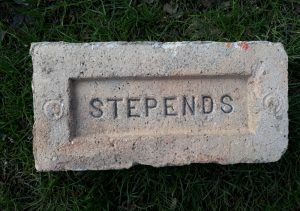 Stepends Brickworks, Plains, Airdrie, Lanarkshire Alternative brickworks include: Newmains Fireclay Works, Morningside, Lanarkshire, Mayfield Brickworks, Carluke, Lanarkshire .